3 Tips To Help With Weight That Are Not About Food. Sometimes we have to think laterally. When it comes to weight and nutrition most of the focus, quite rightly is on what we eat. That makes sense and is obviously the key. However the context in which we eat and even where we eat influences how much we eat. Here are three tips that can have a positive impact on our eating habits. 1) Eat at the table with a knife and fork. You are going to eat a bit more slowly and focus on your meal. In turn you are more likely to “hear” the stomach tell you it is full then when you are in front of TV or at the computer. 2) Eat with others. Families who eat together at the table have lower rates of childhood obesity. Small studies show that eating in a pleasant environment where you are not rushed correlates with eating less and even making different selections from the same menu! And having a conversation over a meal is good for the health of your relationships. 3) Eat slowly. Chew your food properly. Put the knife and fork down between mouthfuls. Taste and enjoy the flavor of your meal. People who eat slowly are less likely to be overweight. Health is made harder than it needs to be. Simple things can make a big difference. 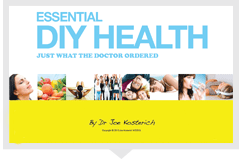 Apply the principles outlined above and help yourself on your journey to better health.